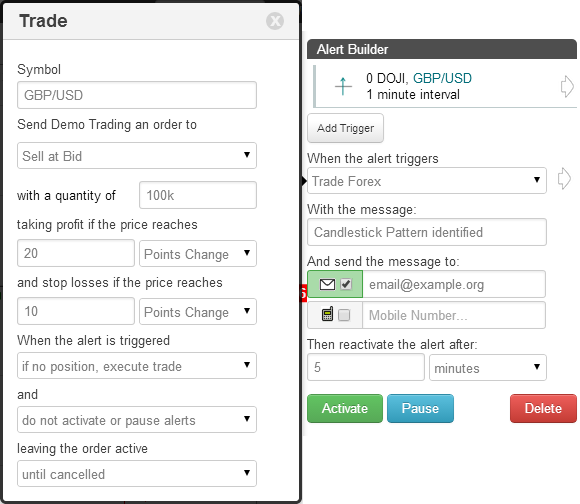 On the TimeToTrade charts, a Standard Deviation indicator can then be used to execute trades, provide an Email or SMS text message notification when your candlestick chart patterns have been met or backtest a trading strategy. Standard Deviation is a statistical measure of volatility. It measures the difference between the market’s closing price and its average price over a defined preceding period of time. The more the price ‘deviates’ from its average i.e. the larger the difference between the closing and average prices, the more volatile the price is said to be and the higher the Standard Deviation. The Bollinger Bands® indicator is based on Standard Deviation. In times of high price volatility the Standard Deviation increases and in times of low volatility the Standard Deviation decreases. Learn more about the Standard Deviation indicator. Rising Threshold Alert Trigger, is triggered when the value of the Standard Deviation rises above a specified value. Falling Threshold Alert Trigger, is triggered when the value of the Standard Deviation falls below a specified value. Break-Out Alert Trigger, is triggered when the Standard Deviation increases by a specified value within a the selected interval period. Pull-Back Alert Trigger, is triggered when the Standard Deviation decreases by a specified value within a the selected interval period. Percentage Break-out Alert Trigger, is triggered when the Standard Deviation increases by a specified value within a the selected interval period. Percentage Pull-back Alert Trigger, is triggered when the Standard Deviation decreases by a specified percentage within a the selected interval period. Above Alert Trigger, is triggered when the Standard Deviation is above a specified value. Below Alert Trigger, is triggered when the Standard Deviation is below a specified value. Positive Crossover Alert Trigger, is triggered when the Standard Deviation rises above / crosses over another indicator, price, a specified value or trend line that you have drawn on the chart. Negative Crossover Alert Trigger, is triggered when the Standard Deviation falls below / crosses under another indicator, price, a specified value or trend line that you have drawn on the chart. TimeToTrade can also be used to create alerts on Price and Volume as well as the technical indicators such as Stochastic, RSI, Bollinger Bands and Moving Averages plus a lot more. 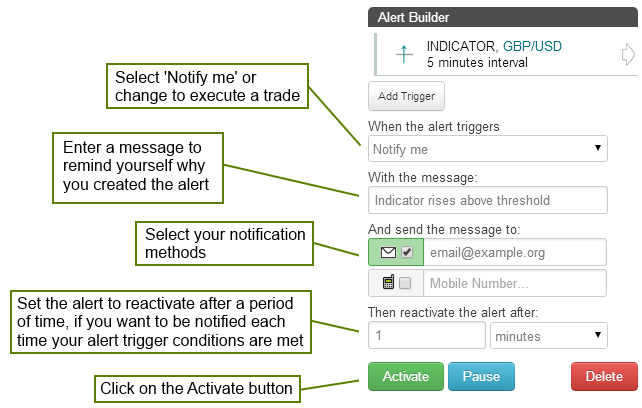 You can also create alerts on your own Custom Indicators. You can also edit the alert message you will receive and be notified by Email and SMS text messages when your alert trigger conditions are met. To learn more about Sequencing and Grouping Multiple Alert Triggers click here. 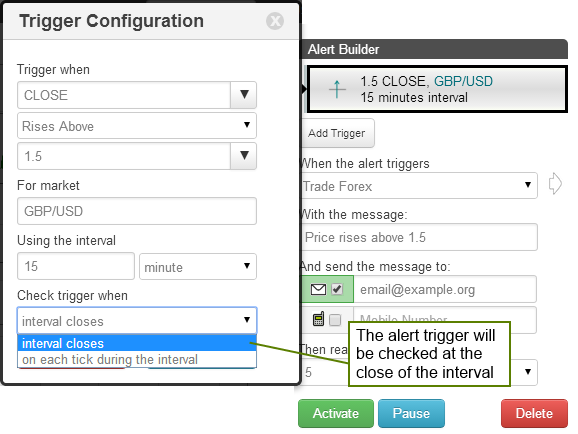 Alerts can be set up to check if the trigger condition has been met at the end of an interval or on each tick during the interval. 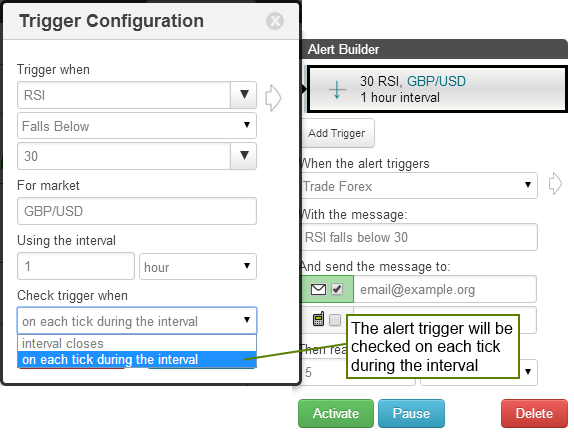 When creating alerts, click on the alert trigger and set the 'Check trigger when' field to 'interval closes' or 'on each tick during the interval' to change the behaviour. Use can use TimeToTrade to execute trades or notify you when price, trendline, technical analysis, volume or candlestick chart conditions are met. Trade-Off The Chart, backtest, simulate and optimise your trading strategies, all without writing a single line of computer code. Set up a FREE account today.